We are proud to now be an official retailer of Cockpit USA. These are the same people who make jackets for our military, & many WWII films. 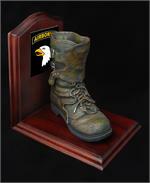 Also available in the Vietnam Jungle Boot , World War 2 Boot,, Paratrooper Jump boot or Vietnam helmet.